The Ozone Monitoring Instrument (OMI) was launched on-board the Earth Observing System (EOS) Aura satellite on 15 July 2004 in a polar orbit with an afternoon equator crossing time near 13:30. OMI is a wide-swath, nadir-looking, push-broom imaging spectrometer, measuring Earth radiance and solar irradiance from ultraviolet to visible wavelengths (270–500 nm) with a spectral resolution of about 0.5 nm. The vertical columns of several trace gases are retrieved with better spatial and temporal sampling than previous instruments of its type. In particular, OMI observations of nitrogen dioxide, sulfur dioxide, and formaldehyde have enabled new applications in air quality (e.g. emission estimates) and hazard monitoring (e.g. volcanic cloud detection for aviation safety). Observations of the ozone abundance and estimates of UV radiation at the ground are used to track the effects of the Montreal Protocol. OMI observations of tropospheric ozone and aerosols together with minor trace gases provide global input for climate research. OMI is one of the four instruments on the Aura platform. Together with the three other instruments – the High Resolution Dynamics Limb Sounder (HIRDLS), the Microwave Limb Sounder (MLS), and the Tropospheric Emission Spectrometer (TES) – Aura has functioned as an integrated platform for atmospheric composition measurements. Aura is part of a constellation of satellites (including the Aqua platform) in similar afternoon orbits known as the A-train. Having many different types of instrumentation in this constellation allows for synergetic uses of the data sets. In this OMI special issue, we highlight scientific research accomplished with 10 years of OMI atmospheric composition measurements, discuss recent improvements in OMI retrieval algorithms and methodologies to utilize the data, and present the status of various OMI data products. The Dutch–Finnish OMI instrument is currently operational on the NASA Earth Observing System (EOS) Aura satellite and was developed under the assignment of the Netherlands Space Office (NSO) and Tekes – Finnish Funding Agency for Innovation. In this paper, we focus on the validation of OMI ozone (PROFOZ) product in the stratosphere using MLS ozone observations. This paper, with its companion paper focusing on the validation in the troposphere by using global ozonesonde observations, provides us with a comprehensive understanding of the data quality of OMI PROFOZ product and impacts of the “row anomaly”. This study derives on-orbit slit functions from the OMI irradiance spectra. The results differ from the widely used preflight slit functions. The on-orbit changes of OMI slit functions are insignificant over time after accounting for the solar activity. Applying the derived on-orbit slit functions to ozone-profile retrieval shows substantial improvements over the preflight slit functions based on comparisons with ozonesonde validations. It is essential to understand the data quality of +10-year OMI ozone product and impacts of the “row anomaly” (RA). We validate the OMI Ozone Profile (PROFOZ) product from Oct 2004 to Dec 2014 against ozonesonde observations globally. Generally, OMI has good agreement with ozonesondes. The spatiotemporal variation of retrieval performance suggests the need to improve OMI’s radiometric calibration especially during the post-RA period to maintain the long-term stability. The Ozone Monitoring Instrument (OMI) has been flying on NASA’s EOS Aura satellite since July 15, 2004. It has measured the concentration of trace gasses in the atmosphere, like ozone, NO2 and SO2. This article describes the trend in performance and calibration parameters of OMI during 12 years of flight. The degradation of the CCD detectors, solar diffusers, spectral calibration and row anomaly are shown. The instrument shows overall degradation that is better than expected. In this study, we demonstrate a very good consistency of the SO2 retrievals from OMI and OMPS using our state-of-the-art principal component analysis technique. Four full years of OMI and OMPS SO2 retrievals, during 2012–2015 have been analyzed over some of the world’s most polluted regions: eastern China, Mexico, and South Africa. The consistency of retrievals between OMI and OMPS make it possible to continue the long-term global SO2 pollution monitoring. This paper presents the independent and simple IFR method to retrieve the FOV of an instrument, i.e. the two-dimensional sensitivity distribution. IFR relies on correlated measurements featuring a higher spatial resolution and was applied to two satellite instruments, GOME-2 and OMI, and a DOAS instrument integrated in an SO2 camera. Our results confirm the commonly applied FOV distributions. IFR is applicable for verification exercises as well as degradation monitoring in the field. In this paper, we describe the new-generation OMI volcanic SO2 algorithm based on our principal component analysis (PCA) retrieval technique. We demonstrate significant improvement in the our new OMI volcanic SO2 data, with the retrieval noise reduced by a factor of 2 as compared with the previous dataset. The algorithm also improves the accuracy for large volcanic eruptions. It is also capable of producing consistent retrievals between different instruments. We show how the surface reflection can vary day to day in the blue part of the sun's spectrum where we measure the pollutant gas nitrogen dioxide using a satellite instrument called OMI. We use information from an imaging spectrometer on another satellite, MODIS, to estimate the angular surface effects. We can then use models of how the sunlight travels through the atmosphere to predict how the angle-dependent surface reflection will impact the values of pollutant levels inferred by OMI. 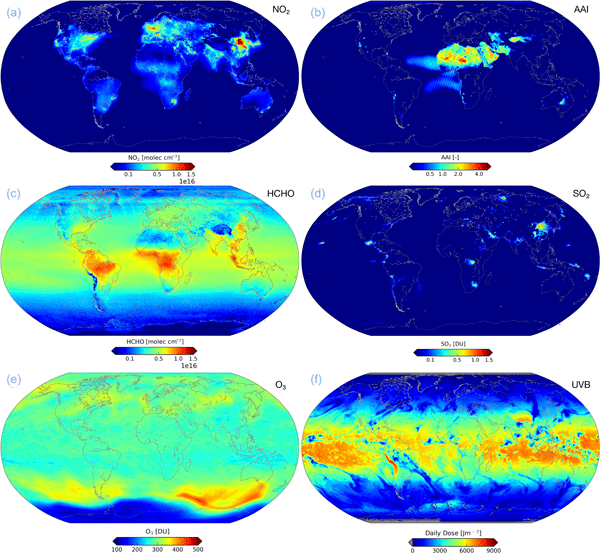 Global surface emissions of nitrogen oxides (NOx) over a 10-year period (2005–2014) are estimated from assimilation of multiple satellite datasets. We present detailed distributions of the estimated NOx emission distributions for all major regions, the diurnal, seasonal, and decadal variability. 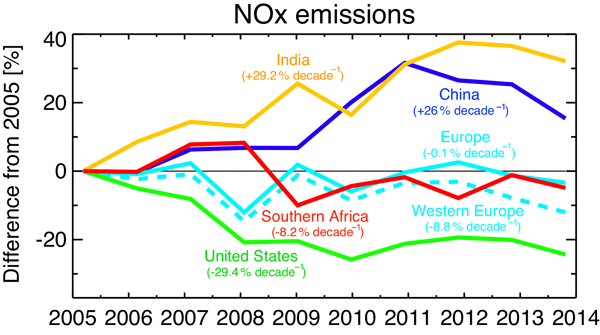 The estimated emissions show a positive trend over India, China, and the Middle East, and a negative trend over the United States, southern Africa, and western Europe. The Ozone Monitoring Instrument (OMI) on board the NASA EOS Aura satellite monitors the concentrations of trace gases. The accuracy of such observations relies partly on information on clouds. The OMI OMCLDO2 product derives the cloud fraction and pressure from the observed radiance in the visible. This paper reports on an improved version of this product. Compared to the previous version, the changes in cloud fraction are very small, but the changes in the cloud pressure can be significant. Volcanic eruptions pose a threat to human populations around the globe, but many active volcanoes are poorly monitored. This paper details the development of an automated volcanic plume detection method with focus on diffuse plumes, utilising daily, global observations of volcanic gases measured by satellites. The developed technique consistently distinguished volcanic plumes over 400 t, from control samples, indicating the potential for implementation within a volcanic alert system. 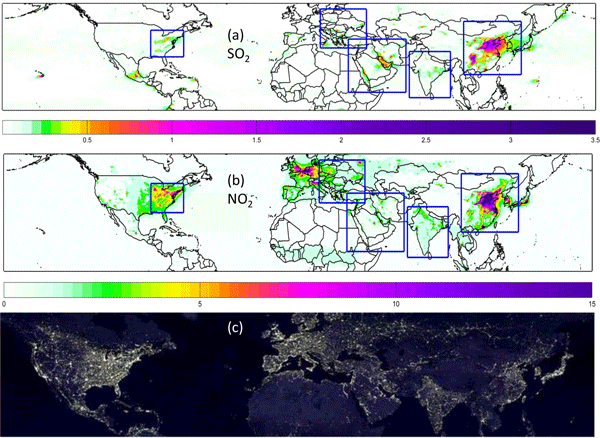 We introduce the first space-based catalogue of SO2 emission sources seen by OMI. The inventory contains about 500 sources. They account for about a half of all SO2 emissions; the remaining half is likely related to sources emitting less than 30 kt yr−1 and not detected by OMI. The sources are grouped by type (volcanoes, power plants, oil- and gas-related sources, and smelters) and country. The catalogue presented herein can be used for verification of available SO2 emission inventories. Water vapor is highly important. The OMI total column water vapor product retrieved using SAO's version 1.0 algorithm agrees well with other reference products over the land but has a low bias over the ocean. The updated OMI water vapor product retrieved using SAO's version 2.1 algorithm largely eliminates the low bias over the ocean, improving the land/ocean consistency and the overall data quality. This dataset can benefit a variety of scientific studies and practical applications. The main focus of this paper is improving an error of OMI nadir ozone profile retrievals due to the presence of polar mesospheric clouds (PMCs), consisting of small light-scattering particles at an altitude of 80–85 km. This error is shown to be systematic bias from ~ −2 at 2 hPa to ~ −20 % at 0.5 hPa and significantly correlated with brightness of PMCs. We reduce this interference of PMCs on ozone retrievals by including the PMC optical depth in the forward-model calculation and retrieval. A new "OMI-minus-OSIRIS" (OmO) prototype dataset for tropospheric NO2 was created by combining information from the OMI satellite instrument, which is sensitive to NO2 in both the troposphere and stratosphere, with information from the OSIRIS satellite instrument, which measures NO2 in the stratosphere. This paper demonstrates that this approach is feasible and could be applied to future geostationary missions. The shapes and sizes of the FoV from the OMI satellite instrument were determined with extensive lab tests but never verified after launch. Here, collocated measurements from MODIS, flying in formation, were used to find the most optimal shape of the OMI FoV. This shape is not quadrangular, as suggested by the provided corner coordinates of a pixel, but rather super-Gaussian shaped and overlapping with the FoV of neighbouring pixels. We present a top-down approach to infer and quantify rain-induced emission pulses of nitrogen oxides from soils using satellite-borne measurements of NO2. We found strong enhancements of NO2 induced by the first intense precipitation after prolonged droughts in many semi-arid regions of the world, in particular in the Sahel. Apart from the clear first-day peak, NO2 VCDs are moderately enhanced compared to background over the following 2 weeks suggesting potential further emissions. The A-train constellation of satellites provides a unique opportunity to analyze near-simultaneous data from several of these sensors. 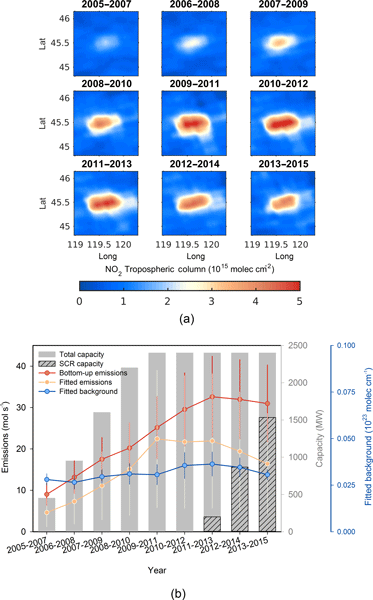 In this paper, retrievals of cloud/aerosols parameters and total column ozone (TCO) from the Aura Ozone Monitoring Instrument (OMI) have been used to develop a variety of neural networks that estimate TOA SWF globally over ocean and land using only OMI data as inputs. Application of our method to other ultraviolet sensors may provide unique estimates of TOA SWF. The multi-spectral possibilities of the OMPS Nadir Mapper instrument are exploited here to perform formaldehyde retrievals. Orbiting the Earth at 824 km, OMPS observes the atmosphere in a time frame similar to instruments belonging to NASA's A-Train constellation, 01:30. We show that OMPS is well suited to measure formaldehyde despite its spectral resolution of 1nm. The comparison of OMPS retrievals with OMI products show good temporal correlation. Volatile organic compounds (VOCs) are important precursors for photochemical smog. Glyoxal is an organic compound produced in the atmosphere from reactions of larger VOCs. OMI satellite observations of glyoxal show a large hotspot over the Pearl River delta. The hotspot can be explained by industrial paint and solvent emissions of aromatic VOCs. Our work shows OMI observations are consistent with current VOC emissions estimates, whereas previous work has suggested large underestimates. Using an exponentially-modified Gaussian method and taking into account the effect of wind on NO2 distributions, we estimate three-year moving-average emissions of summertime NOx from 35 U.S. urban areas directly from NO2 retrievals of the OMI during 2005−2014. Total OMI-derived NOx emissions over U.S. urban areas decreased by 49%, consistent with reductions of 43%, 49%, and 44% in the bottom-up NOx emissions, the weak-wind OMI NO2 burdens, and the averaged NO2 concentrations, respectively. The SO2 observations from OMI and OMPS satellite instruments are validated during the Icelandic Holuhraun fissure eruption in September 2014. The best agreement with the Brewer observations in Sodankylä, Finland can be found with the satellite products that assume the SO2 predominantly located in the lowest levels of the atmosphere. The analysis of the SO2 surface concentrations in northern Finland supports the hypothesis that the volcanic plume was located very close to the surface. The paper describes improvements to the algorithm for the retrieval of nitrogen dioxide (NO2) concentration from measurements of the Ozone Monitoring Instrument (OMI), launched on board NASA's EOS-Aura satellite in 2004. With these improvements - updates of the wavelength calibration and the reference spectra - the OMI results are consistent with independent NO2 measurements and the overall quality of the spectral fit is improved considerably.